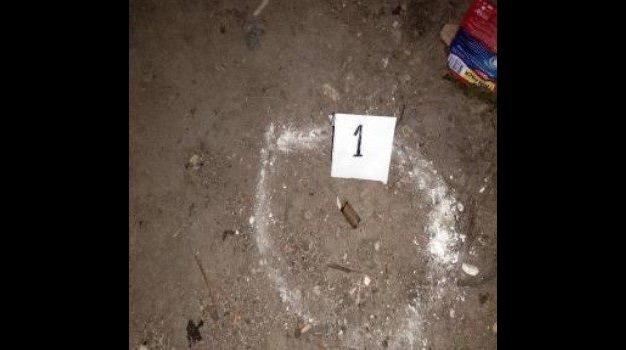 Scene of the Crime Operatives found one spent bullet shell fired from a .45 caliber at the crime scene in Purok Lomboy, Barangay Aguipo in Mabini following the fatal gun attack against Marcos Sebello at 10:30 p.m. on Friday night. A 38-year-old widower who has been tagged by police as a drug personality was shot dead beside his two children, aged five and seven, inside his home in Mabini town allegedly by a female assailant on Friday night. The gunwoman casually went inside the house in Barangay Aguipo, Mabini and shot the victim, Marcos Sebello, 38, in the head while at least seven of his relatives were outside his home, said SPO1 Julius Saavedra of the Mabini Police Station. Sebello was rushed to the Candijay Community Hospital. But due to his severe condition, he was later transferred to the Gov. Celestino Gallares Memorial Hospital in Tagbilaran City where he succumbed to his injuries at 4 p.m. on Saturday. “Kaning biktima gitung-an ni sa iyang duha ka anak nga natulog, unya gidali ni pagsulod sa iyang igsoon pag-sibat atong mga suspek, maoy iyang nakit-an nga nagkadugo na mao tong gisakay og motor unya gihatud sa hospital sa Candijay,” Saavedra said. According to Saavedra, police are considering Sebello’s alleged involvement in the narcotics trade as possible motive behind the killing. Sebello was arrested twice for illegal drug possession but was able to post bail in both instances, Saavedra said. For his part, Sebello’s brother Rocky ocky told investigators that he saw two motorcycle-riding persons clad in hooded jackets stop in front of his brother’s house. The passenger, who Rocky described to be a woman, went inside the house right before he heard a gunshot. Rocky checked on his brother inside the house then tried to go after the gunwoman but the latter fired a warning shot. Saavedra said that investigators found at the crime scene a single spent shell which was fired from .45 caliber pistol. On February 5, Sebello allegedly sold shabu to a poseur-buyer during a “test-buy” prompting police to set a drug buy-bust against him. He however was killed before police could carry out the sting operation, said Saavedra.